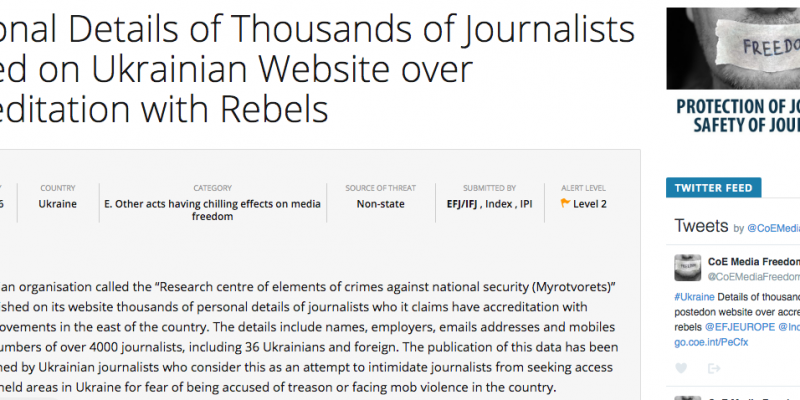 A Ukrainian organisation working on national security published thousands of personal details of journalists on its website on 7 May claiming the journalists had accreditation with pro-Russian separatists in the eastern Ukraine. It further accused them of ‘co-operating with terrorist organisations’ and violating Ukraine law. 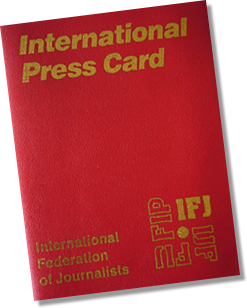 The European and International Federation of Journalists (EFJ/IFJ) back their Ukrainian affiliates the National Union of Journalists of Ukraine (NUJU) and the Independent Media Trade Union of Ukraine (IMTUU) in denouncing this leak which endangers journalists’ safety and urge the Ukrainian government to bring those responsible to justice. The private contact details published by Myrotvorets (The Peacemaker in English) include names, employers, email addresses and phone numbers of over 4 000 journalists and media workers based in Ukraine. It includes both local and international media, such as AFP, Le Monde, Al Jazeera, BBC, CNN, Gazeta Wyborcza, Kyiv Post, New York Times and Reuters. Myrotvorets, the “Research centre of elements of crimes against national security”, is believed to have close links with Ukrainian security services. Ukrainian journalists are outraged by the publication of the data, considering it an attempt to intimidate journalists who seek access to report on pro-Russian-held areas in the country. Journalists are afraid of being accused of treason or facing mob violence. Ukraine’s Prosecutor General’s Office announced on 11 May that it had launched an investigation into the data leak. Media reports say the deputy head of Ukraine’s information ministry has asked those responsible to shut down the website without any success yet. 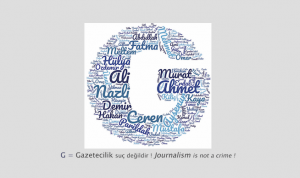 EFJ President Mogens Blicher Bjerregaard said : “We know that some journalists on the list already faced threats. We call on Ukrainian authorities to guarantee the safety of all journalists in Ukraine. They should not be harassed just for doing their job”. 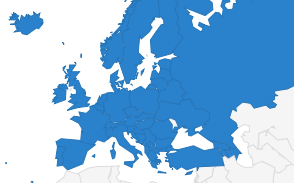 The European and International Federation of Journalists have submitted the case to the Council of Europe Platform to promotion the protection of journalism and the safety of journalists and to the Mapping Media Freedom project.